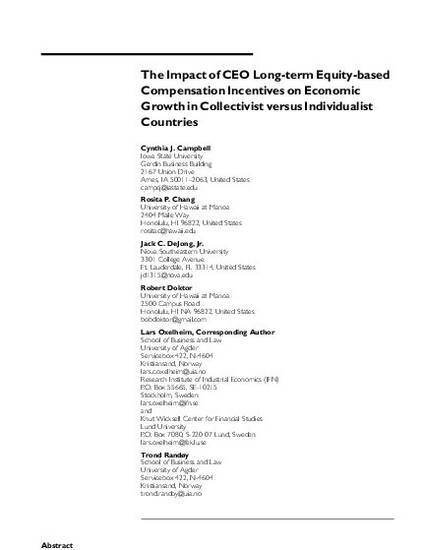 This article is published as Campbell, C.J., Chang,R.P., DeJong Jr., J.C.,Doktor, R., Oxelheim, L., Randoy, T., The Impact of CEO Long-term Equity-based Compensation Incentives on Economic Growth in Collectivist versus Individualist Countries. Asian Economic Papers. ; Summer 2016, 15(2); 109-133. Doi: 10.1162/ASEP_a_00432. Posted with permission.